Brad Gustafson’s Renegade Leadership paints the picture of how education can be transformed without the usual calls for revolution and revolt. Although focused on fostering an innovative learning environment, the book is at the same time grounded in a belief about best practices, with an emphasis on teacher clarity, formative assessment, feedback, student discussion and teacher-student relationships. To visualise this convergence, Gustafson uses a series of quadrants, with the ultimate aim being the amplification of learning. Gustafson grapples with a number of ideas, such as values, collaboration, ownership, digital connectivity, experimental learning and professional development. In addition to this, it is broken up with various case studies involving current educators and historical figures who fit the renegade mould. With references to augmented reality, drones, 3D printers, podcasting, twitter chats, hashtags, makerspaces, microcredentialing and flipped instruction, it would be easy to think of this book as simply being about technology. However, it is more than that. It is better considered a book about beliefs. 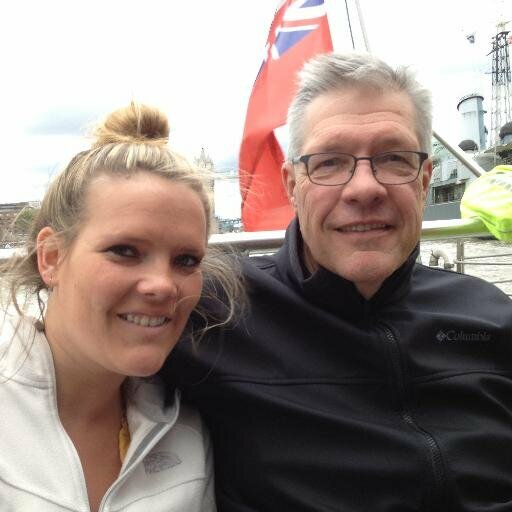 This is made clear in Gustafson’s list of leadership traits that he considers pertinent to his practice, including pedagogical precision, transparency, connectedness, innovation, risk-taking, capacity building, child-centred, empowered learner, impact and moral courage. Without these beliefs, many of the opportunities outlined would not be possible. Although aimed at leaders, this is a book that has take-aways for all educators. With guiding questions and challenges for each chapter, a range of suggestions for subtle shifts, a self-diagnostic tool and a companion website with further resources, Gustafson provides the ammunition needed to confidently tackle innovative change. Through his tales of failure and success, Gustafson outlines a compelling vision of hope that simply cannot be ignored. DISCLOSURE: Other than the gift of learning offered by this book, I did not receive any benefits or gains for writing this review. 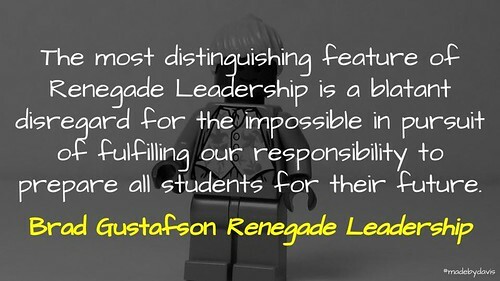 REVIEW: Renegade Leadership by @gustafsonbrad by Aaron Davis is licensed under a Creative Commons Attribution-ShareAlike 4.0 International License. Thanks Aaron – sounds like compelling reading. I am adding “Renegade Leadership” to my reading list. I hope all is well with you – you’ve been busy! Well worth it Bob. So much to take-away from it, whether it be the successes or the failures. On top of that, Brad has compiled an extensive resource to carry on the conversation afterwards.